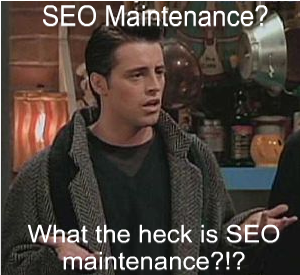 What the Heck is “SEO Maintenance,” Anyway? To make sure there is a fresh take on this popular post written a few years ago, I recently followed up with a companion post to this one, titled, “How to Improve SEO: A “Beyond the Basics” Monthly SEO Checklist.” If you like this post on “SEO Maintenance” then go check that one out next. I inquired as to what exactly her former consultant was doing to “maintain” the SEO so I could get an idea of what services she was looking for and if I was the right fit or not. She confessed that she wasn’t even sure what maintenance even entailed. I prodded a little more. Was he doing social media? Blogging? Creating content? She didn’t think so but still wasn’t entirely sure. Ladies and Gentleman, as a side note, this is a common scenario I hear of from small business owners. They’re shelling out $300-500+ a month and they’re not exactly sure what they’re getting, aside from a PDF Google Analytics report with data and numbers that they have no idea what to even do with. Now, I’m not sitting here entirely blaming these SEO companies. There are some great professionals out there that, despite their best intentions to explain the analytics report and describe the activities they’re doing and why, it’s lost on the business owner who is too busy to sit for a moment and not just listen – but hear. This is why that model is broken. Most SEO professionals don’t connect deeply with their customers and resentment grows on both sides. But I digress…improving SEO client relationships is a talk for another time. What I do want to get back to is what exactly IS “SEO Maintenance” and what does it involve. Because I confess – this could mean a million things in this day and age. SEO should be woven into the culture of organizations; it should be a layer of best practices that is applied to many different marketing channels and activities: on-site and off-site content creation, PR, social media marketing, UX, conversion optimization, technical website best practices, and more. How competitive are your keywords? How savvy is your competition? What resources do you have, in-house or external? What ongoing marketing activities do you plan on doing? What ongoing content do you plan on creating? Who reviews your analytics now? Who maintains your website now? Remember – strategy first, implementation second. Just don’t’ stay in strategy mode too long. What haven’t I thought about here? If you’re an SEO professional, what do you do that involves monthly SEO maintenance? If you’re a business who gets regular SEO maintenance, what exactly does that mean? What a timely post! I have neglected my blog for a long time and I have been planning to do some maintenance work on it. This is a big help! Love the analogy about landscaping and SEO maintenance. And the Chandler photo, too! Thanks, Nica! How are you? Yeah, I really enjoyed putting this post together as I’ve been hearing more business owners complain about spending hundreds of dollars on “SEO” every month and not sure what they’re even getting out of it. Consistent, optimized content all the way. Woohoo! This is an incredibly helpful article, I am the marketing manager for a start up company that’s on the fast track to growth, we just built a website but we need to maintain ongoing SEO. This was really simple and easy to grasp. Please write more, THANK YOU so much! Adriana – thanks so much for your comment. So glad it was helpful. Good luck and stay in touch to keep me posted how your efforts are going and if any questions come up. It is a great article from every angle. But if I summarize it then once you build up your rankings for a keyword, the competitors and search algorithms both are against you to take the ranks away from you, and you need to do efforts to stay up. That’s where everything applies in the context of SEO maintenance. The big one that I didn’t see here is competitor analysis. What are THEY doing, and how have they changed their strategy once your client begins pulling ahead of them? How do you react to those changes? Chris – thanks so much for commenting and you are definitely right. While I’m an advocate for competitive analysis during audits, I’m definitely a big fan of “SERPS checking” for routine maintenance. We might be referring to the same thing – I wrote this blog post to share more about evolving your strategy to keep ahead of direct and indirect competition: https://jennymunn.com/serps-checking-seo-trends-in-your-industry/. I should update this post for sure. Thanks again!